For the full list of excipients, see section “Pharmaceutical Particulars”. Lyophilisate and solvent for suspension for injection. Lyophilisate: off-white or cream-coloured pellet. For immunisation of horses against Streptococcus equi to reduce clinical signs and occurrence of lymph node abscesses. Onset of immunity: 2 weeks after basic vaccination. Duration of immunity: up to 3 months. The vaccine is intended for use in horses for which a risk of Streptococcus equi infection has been clearly identified, due to contact with horses from areas where this pathogen is known to be present, e.g. stables with horses that travel to shows and/or competitions in such areas, or stables that obtain or have livery horses from such areas. Shedding of the vaccine strain from the injection site can be observed for a period of four days after vaccination. From literature, it is known that a very low number of horses may develop purpura haemorrhagica if they are vaccinated shortly after infection. Purpura haemorrhagica has not been observed in any of the safety studies performed during development of Equilis StrepE. As the incidence of purpura haemorrhagica is very low, its occurrence cannot be ruled out completely. In the challenge studies performed by the company, insufficient protection was seen in approximately one quarter of horses vaccinated with the recommended dose. Do not use antibiotics within one week after vaccination. The vaccine strain is sensitive to penicillins, tetracyclines, macrolides and lincomycin. The vaccine strain is resistant to aminoglycosides, sulphonamides, flumequine and trimetroprim-sulfa combinations. Only healthy horses should be vaccinated. Ensure that the lyophilisate is completely reconstituted before use. Basic vaccination performed during an outbreak is not efficacious because immunity is insufficient until basic vaccination has been completed. This product contains a live bacterial deletion mutant with a limited growth potential in mammalian tissue. Accidental self-injection may result in an inflammatory reaction with severe pain and swelling. Special care must be taken when connecting the applicator to the needle to avoid needle-stick injuries. In case of accidental self-injection, seek medical advice immediately and show the package insert or the label to the physician even if only a very small amount is injected. 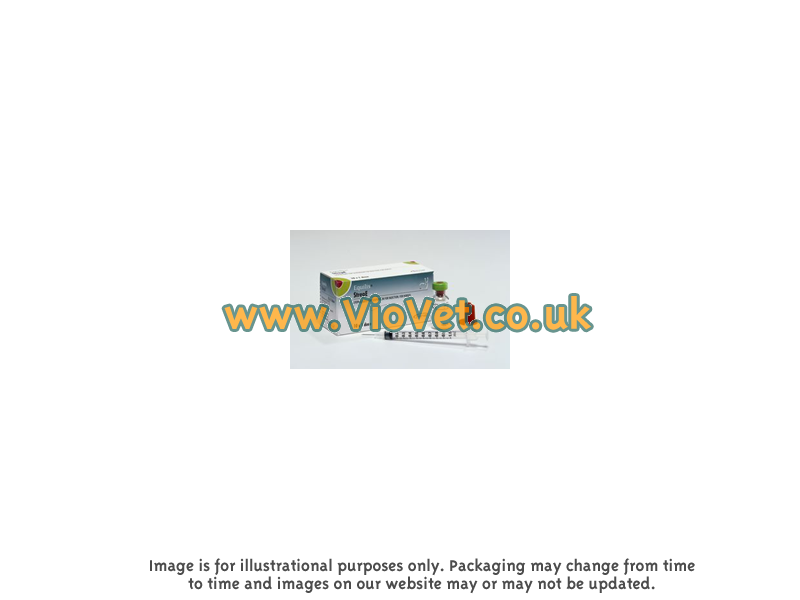 This product contains a live auxotrophic deletion mutant Streptococcus equi vaccine strain with attenuated virulence. However, the bacterial compounds of this product can cause an inflammatory reaction with intense and painful swelling after accidental injection. Anti-inflammatory therapy is indicated even if only a very small amount of the product in injected. An additional antibiotic treatment should be considered for safety reasons. The sensitivity of the vaccine strain to antibiotics is listed above (under section “Special Warnings”). After vaccination a diffusely swollen reaction, which may be warm or painful, develops at the injection site within 4 hours. The reaction is maximal at 2–3 days post vaccination with a maximum area of 3 cm by 8 cm. This swelling resolves completely within 3 weeks and normally has no effect on the appetite of the vaccinated animal and causes no apparent discomfort. The vaccine organism may establish a small suppurative inflammation locally at the injection site, leading to a disruption of the overlaying lip mucosa and subsequent discharge fluid and inflammatory cells. A slight cloudy discharge commonly occurs from the mucosal injection site at 3 or 4 days post vaccination. Slight enlargements, which may be transient painful, of the retropharyngeal and mandibular lymph nodes may occur for a few days after vaccination. In very rare cases an abscess may develop at the injection site or in the regional lymph nodes. Further, an increase in rectal temperature up to 2 °C may occur on the day of vaccination. In rare cases, inappetence, fever, shivering and diffuse oedematous swellings (e.g. facial oedema, swollen muzzle/upper lip) may be observed. In very rare cases depression may develop. Submucosal vaccination with 0.2 ml of reconstituted product. Basic vaccination: horses from 4 months of age onwards receive two vaccinations of one dose with a 4 week interval. Revaccinate every three months to maintain immunity. A priming response is maintained for up to six months after basic vaccination. Therefore only a single dose of vaccine is needed to restore immunity. It is recommended that all horses stabled together are vaccinated. Allow the sterile solvent to reach room temperature (15 - 25 °C). Aseptically reconstitute the lyophilisate with 0.3 ml of the sterile solvent provided. Allow the reconstituted vaccine to sit for 1 minute and then carefully swirl the contents to mix. Do NOT shake. Withdraw 0.2 ml of the reconstituted vaccine into the syringe provided (see Figure 1) and connect the applicator to the needle (see Figure 2). Restrain the animal’s head, lift the upper lip and insert the needle into the inside of the upper lip until the applicator rests on the lip. Administer the whole contents of the syringe into the inside of the upper lip (see Figure 3). In addition to the clinical signs given under section 'Adverse Reactions', vaccination with a ten times overdose may induce an abscess in one of the submandibular lymph nodes. The abscesses drain purulent material from 2 weeks after vaccination, but heal without intervention within a month thereafter. Furthermore, an increase in rectal temperature up to 2.5 °C may occur on the day of vaccination. Slight apathy may occasionally be observed one day after vaccination. Pharmacotherapeutic group: immunological for equidae, live bacterial vaccine, ATCvet code: QI05AE. To stimulate immunity against Streptococcus equi. The vaccine strain is a deletion mutant with a limited growth potential in mammalian tissue. It is able to multiply locally at the submucosal injection site during a short period and is shed into the oro-nasal cavity during a few days, but the vaccine strain does not survive on the oro-nasal mucosa and does not disseminate systemically at the recommended dose. Do not mix with any other veterinary medicinal products except the solvent supplied for use with the vaccine. Shelf life after reconstitution according to directions: 4 hours. Store in a refrigerator (2 °C – 8 °C). Protect from light. Each package of Equilis StrepE contains: 10 vials with lyophilisate and 10 vials of 0.5 ml solvent, each in 3 ml Type I glass vials closed with a halogenobutyl rubber stopper and sealed with a coded aluminium cap, 10 applicators, 10 syringes with needles. There are currently no questions for Equilis Vaccine For Horses - be the first to ask one!